The Glenn Beck Review: Glenn Beck's tree of "revolution"
Glenn Beck is on a well deserved vacation this week affording the Review time to analyze and address some of his more common themes or symbols to expose as flawed at best and in fact ridiculous. Among one of his more famous drawings is the Tree of Revolution as seen below. This was introduced in September of 2009 and it was used again this last Monday on Beck's show, which was hosted by Judge Napolitano, to review Beck's theories and ideas. According to the blog, The Train of Thought, this tree is a "beautiful piece of work." It's a piece of work alright. According to that blog, "Che… Woodrow Wilson… Saul Alinsky… ACORN! Unions… Bill Ayers… Dollar bills! Now we can all clearly see that Obama is the end result of decades of unrelated people, events and currencies." The key here is the word "unrelated." If an honest pundit wanted to show a tree like this, it would be the tree of American liberalism, not "revolution." It would not have the SDS (Student for a Democratic Society) above Wilson; it would have FDR, the President who - like Obama - also inherited an economy that was left in shambles by his Republican predecessor. One person, who does not belong anywhere near this mislabled tree, is Che Guevara (lower left). He does belong on a tree of revolution with Karl Marx at the base and Lenin, Trotsky, Guevara, Castro, Mao and others with, perhaps, the President of China, Hu Jintao where Obama is depicted on the image above. Part of Beck's method of communication is to shuffle radicals in with reformers (liberals and progressives) and make them appear to come from the same line of thinking. This is called mass deception, and Glenn Beck is a master at making the blend of reform and radical seem real, informative and coherent. "Students for a Democratic Society is a radical, multi-issue student and youth organization working to build power in our schools and communities." They are part of the occasional grassroots organizing for the Democratic Party, the part that becomes disillusioned when the candidate that they occasionally get elected turns out like President Obama, i.e., another liberal corporatist. Do they belong on Beck's tree of "REVOLUTION?" Perhaps, but the association - like that of Bill Ayers - is loose at best. The crisis that they sought to provoke was not on the economy as Beck often alludes; it was to place undue strains on the local governments in such a way that would force the federal government to step in with a genuine anti-poverty program. Do Cloward and Piven belong on the Tree of Revolution or a Tree of Reform? This approach to resolving poverty is not a revolutionary tactic; thus, they belong on a Tree of Reform between FDR and Obama. However, the Cloward and Piven theory does not and cannot apply to the federal government. If the federal government goes broke, there would be no next higher level of government to step in and resolve the crisis with re-distributive policies or anti-re-distributive policies. The idea that Cloward and Piven's theory is somehow being used by this Administration to create a crisis makes for great entertainment from a rodeo clown, but it has no basis in reality. Beck implies that the theory is being employed, and that is the reason the national debt is ballooning. It makes for good scare tactics, but what is the reality of our nation's debt? Because the national debt has significantly grown (under Presidents Reagan, Bush and Bush) since they authored this theory, the Great Recession that we are slowly crawling back from limits just what the federal government can do to eliminate poverty within the confines of (comprehensive) reforms under Obama. It's a challenge to get the spending needed just to get the economy back on track, say nothing of eliminating poverty. 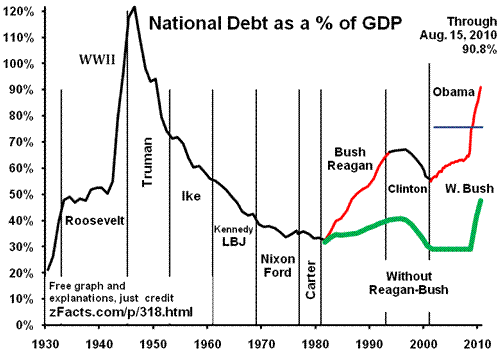 Since Beck keeps insisting that the Cloward and Piven theory is being employed to create a crisis and destroy the system, context is needed for those like Beck and his frightened followers to understand where the national debt is currently, compared to where it has been in the past. They like to scare you with how much we owe, but what about the flip side? How much are we owed? When you owe money you owe it to someone, and about $4 trillion is owed to foreign governments etc., but we Americans are owed about $9 trillion. Some will say "they'll never pay us." But in that case, it's us not paying us, so if we don't get paid, we don't pay. Below you can see that $4.5 trillion is owed to gov. trust funds -- a lot of that is owed to those who will collect social security. Almost $1 trillion supports the U.S. dollar and will never need to be paid back, unless we stop using money. Also remember that in the financial crisis the government bought about $1 trillion in mortgages and other IOUs, and although some will go bad, we now own a lot of assets that will later be sold to pay off the debt. Does this mean that we can continue to spend like "drunken sailors?" Yes and no. We need more stimulus spending to serve as a bridge to a future economic recovery (see "Why Borrow and Spend for Economic Stimulus"), and we need to study solutions to this debt bomb before it reaches historic highs. That is the reason the President signed an executive order to create the National Commission on Fiscal Responsibility and Reform. We need calm analysis and firm resolve. Glenn Beck's "Tree of Revolution" and misinformation about the Cloward and Piven theory, which is not and cannot be employed, do not help the Americans, who watch Beck's show on Fox, understand the real challenges we face and need to overcome.